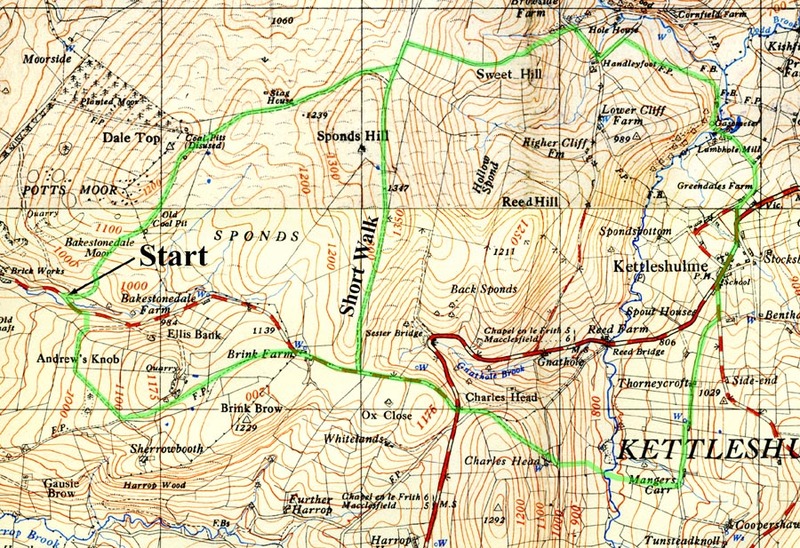 A walk from Pott Shrigley to Kettleshulme and back, following the boundary of Lyme Park. About 12km. (7½ miles) taking 4 hours. Can be shortened to 7km (4½ miles). Turn left out of the car park and follow the road uphill for 50-100 metres and cross stile on the right hand side of road. Proceed uphill and follow wall on right to an old wall with gaps. Cross the wall and head diagonally across the next field bearing right of enclosure of small trees to reach the wall ahead. Turn left but do not cross the wall. Follow the wall to reach a cattle grid and stile immediately in front. This is part of the Gritstone Trail. Walk through trees and then bear left walking on the right hand side of a wall and following waymarks posts to reach a farm and the road. Turn right along the road for about 400m to a stile on the left. The long and short walks diverge at this point. Short walk Go over the stile and along the path which climbs gently to reach a high point where there is a viewfinder on the right (signposted). This indicates that on a clear day the Yorkshire Pennines, the Shropshire Hills and the Welsh Mountains can all be seen. On the left of the path is the summit of Sponds Hill. Continue on the path until it becomes enclosed in two walls. Turn left (before this enclosure) along the wall. At this point the route of the long walk rejoins the path and further instructions for the short walk are given from (*) onwards. Long walk Continue on the road (passing the stile for the short walk) to the road junction. From the road there are splendid views of Windgather rocks and to the right, the ridge leading up to Shining Tor. At the road junction go straight across the road to a signpost and continue in the same direction ignoring the path to the left and in a few yards you meet a farm track. Turn left along the track and follow it to its end at Charles Head Farm where ahead of you is a post with a number of waymarks. Turn right at this post, going down a cobbled path and through a gate at the bottom of the track and into a field. Moving forward in the same direction you will see a grassy track going downhill and to the right. Follow this but where it levels out and disappears continue downhill with the field boundary on your right, passing a stone barn, to a footbridge at the bottom. Cross the bridge and turn left uphill passing trees on your left. Continue in the same direction with field boundaries on both sides, to the far end of the field. Turn left to and through a gate ahead of you to a track. Follow this past several farms. Turn left when the road is reached and then right onto the Macclesfield to Kettleshulme road. Continue through the village of Kettleshulme for about 400 m and when the road curves sharply to the right go left down Kishfield Lane. Immediately before the terraced cottages turn left downhill, along a track leading to Lumbhole Cotton Mill. Cross the river, continue along the lane, past a house on the right, on to the broad green track curving to the left, until a stone stile is reached and crossed. In the next field go over a slight rise and continue to the next stile. Go over the stile and proceed straight on for some distance until Handley Fold Farm comes into vies. Leave the field by the stone stile on the right (this stile is to right of a gate) and turn right onto an attractive tree lined but muddy footpath. Follow this to the road. Turn left onto the road and follow it to a T junction. Cross the road to a stile with a signpost to Lyme Park. The path climbs steeply uphill, at first following a hedge and curving left, and then swinging to the right. The path follows the stone wall to the top of the hill, following first the stone wall on the right and then one on the left. There is a climb of 122m (400 feet) which is the hardest on the walk but at the top the view is rewarding. Bowstone Gate Farm can be seen on the summit ridge to the right. Turn left onto a track and in about 100m after crossing a stile turn right along a wall with the wall on your right. This is the boundary wall of Lyme Park. (*)Continue along the boundary wall of Lyme Park. Deer can often be seen grazing on open ground in the park. Walk over the first slight ridge, continue, and where paths diverge take the path which forks left away from the wall before the next ridge is reached. The path goes downhill over a final stile before returning to the start of the walk.